Yes, this new chapter in the saga features even more fearsome dinosaurs than ever before. And as in previous chapters, those dinosaurs get loose and get to munch on the silly, greedy humans who brought them into being, and there’s always fun in that. But beyond that and the basic pleasures of monster movies, there’s just not much more here that’s new and thrilling here. It’s a sequel that looks and feels obligatory, devoid of anything meaningful to say or add to a franchise that started two decades ago with so much intelligence, ingenuity, and heart. It’s been three years after the Indominus Rex got loose and brought about the destruction of the Jurassic World resort. Dinosaurs roam Isla Nublar freely, but pre-history is about to repeat itself with another extinction level event threatening their existence. The island’s long-dormant volcano is set to erupt and obliterate all that remains of the park and anything living there. The world outside the island, meanwhile, debates over whether to save the once-again endangered creatures or let nature return them to extinction. 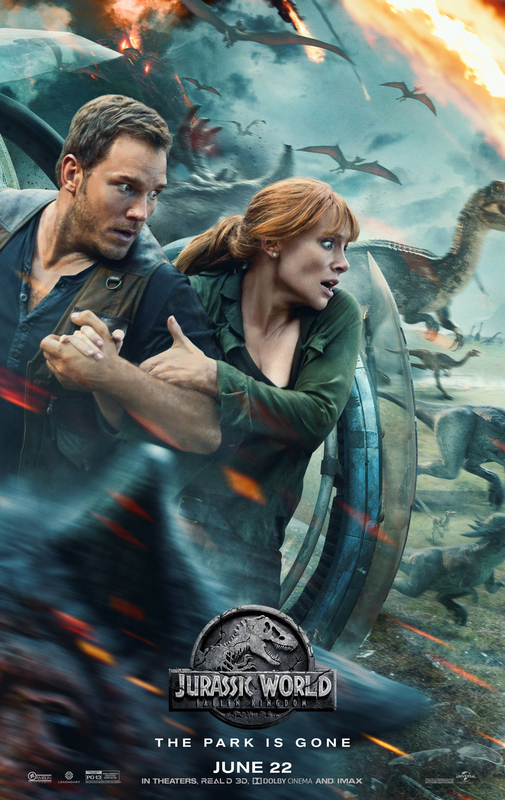 Former park staffers Owen Grady (Chris Pratt) and Claire Dearing (Bryce Dallas Howard) are recruited to lead a rescue operation to the island. Claire, now the head of a dinosaur advocacy group, enthusiastically signs on, while Owen only agrees in order to save Blue, the female velociraptor he worked with on the island since she was a hatchling. Not long after their arrival on the island, the two discover there’s more going on than just a rescue op. If they can survive an erupting volcano and Isla Nublar’s remaining carnivorous species, they’ll have to contend with a greedy entrepreneur (Rafe Spall) and their old friend Dr. Henry Wu (BD Wong), who still hasn’t figured out that creating more dinosaurs via genetic manipulation is a really bad idea. 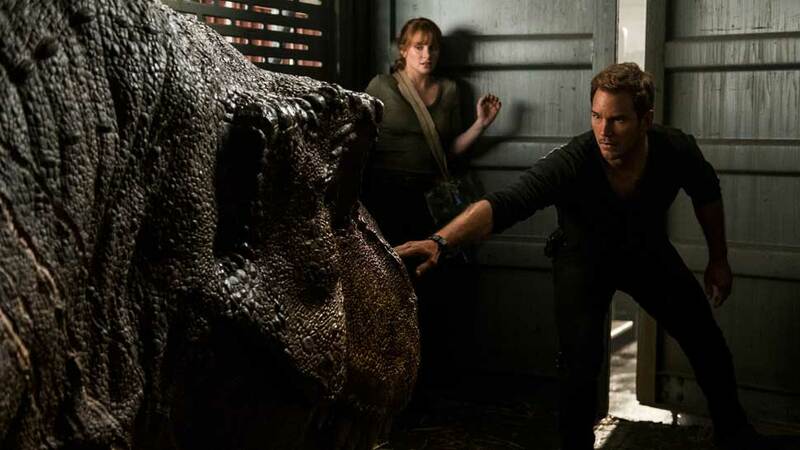 The stupendous box office success of 2015’s “Jurassic World” proved beyond measure that movie audiences still had an appetite for action adventures built around dinosaurs, and so a sequel was pretty much a foregone conclusion. But that film banked a great deal on nostalgia. Coming as it did 20 years after Steven Spielberg first brought Michael Crichton’s novel “Jurassic Park” to the big screen, it recycled beloved images, rather than putting forth new ideas. Yes, there were new dinosaurs and new characters, but the formula was still relatively the same. Arrogant humans set out to create life via science and control nature itself. Then nature gets loose and puts the silly humans in their place. Lots of running and screaming happens along the way. “Fallen Kingdom” does continue plot threads dangled in the 2015 film. However, it still suffers from that same dearth of inspiration and ingenuity. Thus, it falls into the trap of many sequels. Does it deliver eye-popping visuals and solid thrills? Sure. If that and a bucket of popcorn are all you’re looking forward to here, then you’ll get your money’s worth. But beyond that, there’s little to make this new entry in the franchise memorable. Functional, yes, but memorable? No. All that said, “Jurassic World: Fallen Kingdom” delivers enough fun and thrills to merit a trip to the cineplex, if only to see the dinos stomping around in all their enormous glory on a big screen. They are, after all, the real stars here. The humans, specifically Pratt and Howard, don’t do much here. They bicker with and pine for each other, then run and hide when the beasties show up. So if you love dinosaurs and dinosaur movies, treat yourself to “Jurassic World: Fallen Kingdom.” You’ll likely have a very good time. It’s just a shame that the filmmakers behind these new films don’t aspire for their creations to be more than just popcorn movies, to do or say more than just the same old moralizing about man’s arrogance and greed. Starring Chris Pratt, Bryce Dallas Howard, Rafe Spall, Justice Smith, Daniella Pineda, James Cromwell, Toby Jones, Ted Levine, BD Wong, Isabella Sermon, Geraldine Chaplin, and Jeff Goldblum. Directed by J.A. Bayona.